A huge proportion of our gut is made up of bacteria, and a balance of “good” and “bad” bacteria is normally touted as the key to overall health. Many of these bacteria are essential for the proper functioning of the body, and without them we would be unable to survive. The beneficial bacteria are normally termed “probiotics”, and there are a number of these that are considered important, and which it is possible to get from the diet. Read on to discover arguments for and against the use of probiotic foods for reducing the unpleasant symptom of bloating. Some probiotics have been shown to work in some clinical trials. Research from 2011 demonstrates that certain probiotics, such as Lactobacillus rhamnosus GG, shorten infectious diarrhea and benefit the digestive system. Therefore, taking specific probiotics for abdominal bloating caused by digestive problems could prove beneficial. Many probiotics live within certain healthy foods, such as natural yogurts. Although there is little evidence to prove the oft-touted myth that natural yogurts will “balance your gut” and “restore the digestive system”, eating the yogurts will provide much needed nutrients that will contribute to a healthy body. The use of these live bacteria for restoring the natural balance of bacteria in the gut is widely believed to cure a range of ills, including bloating. However, the evidence supporting these health claims is sparse, and is arguably little more than a clever marketing gimmick. 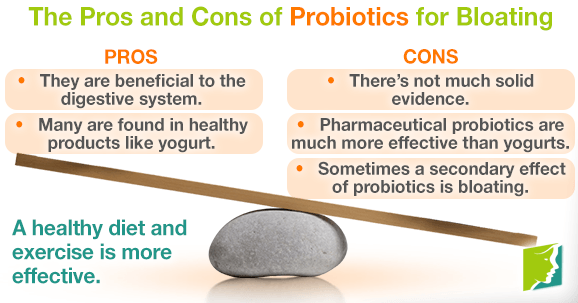 There is likely a vast gap between the effectiveness of pharmaceutical-grade probiotics that have been shown to have some health benefits and the commercial “probiotic” yogurts and pills that are advertised on television and sold in supermarkets. These claims are unproven at best, and completely false at worst. In fact, the company “Dannon” has been made to drop its claims of its yogurts “relieving irregularity” due to the lack of robust clinical supporting evidence. Although this will not happen to everybody, there is a chance of side effects from taking probiotics, and one of these side effects is bloating. Therefore, taking probiotics for bloating might actually have a counter effect and worsen any existing bloating you might have. By taking into account the evidence (or lack thereof) regarding whether or not probiotics actually reduce bloating, it is safe to conclude that at this point it is a waste of money and time to invest in products if the sole purpose is to take probiotics for bloating. To prevent bloating, all that should be needed is a healthy diet and plenty of exercise while we wait for the evidence to prove that probiotics for bloating are in fact helpful. How Do I Treat Bloating Associated with Menopause? Bloating is a common symptom of menopause.If you're experiencing bloating during menopause, there are options for relief. Bloating and wind are a constant issue for many women. Read more about five tips that will let you deflate without much effort.